Whose is the Roman statue found in Rupite? 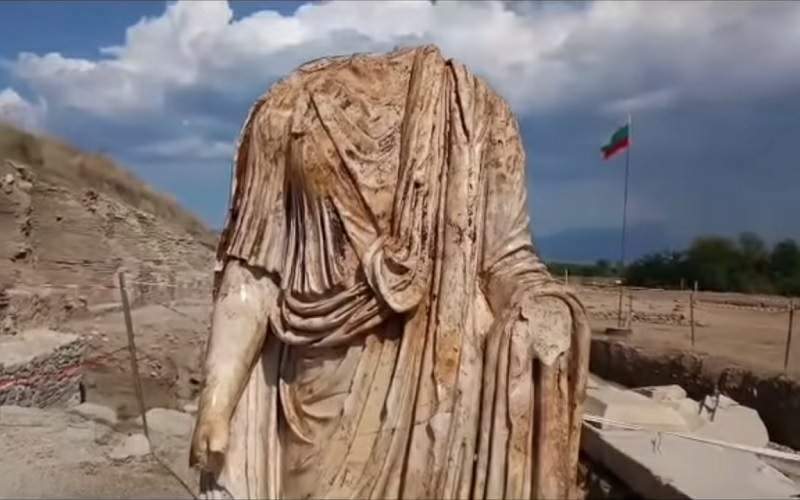 A Roman statue was found this summer during archaeological excavations near the village of Rupite, Bulgaria. Back in the time, the Roman city of Heraclea Sintica was situated there. The statue, whose head is missing, is a full-length man wearing a toga and dating back to the I-II Century AD. It is made of high-quality white marble and in its original form was higher than human height – about 2.40 meters. Assoc. Dr. Ludmil Vagalinski and his team lead the study of the place. According to the archeologist, it is obvious that the sculpture depicts a significant inhabitant of Heraclea Sintica. One of the working hypotheses is that it was the agonet (organizer of the sporting events) Tiberius Claudius Bacchius. The assumption is based on discovered near the statue, full-length inscription from the same period, mentioning the name of the notorious Roman. Until the head of the statue is found, however, it cannot be said for sure who is depicted on it, but it is not excluded that it may even be a Roman Emperor. Another significant discovery of the excavations is an inscription with the rulers of the city, according to which Heraclea Sintica was among the most notable centers in the area alongside Thessalonica (present-day Thessaloniki). Archaeologists have researched the area for more than two decades. The findings will become part of the exhibition of the Historical Museum in Petrich, Bulgaria.